When you have a fireplace, you have many options for fireplace mantels. If your tastes run to lavish furnishings, rich fabrics, and antiques, an ornate fireplace mantel may be exactly what you are looking for to complement your room. A gorgeous ornate mantel can be the show stopping focal point of an elegant sitting room, foyer, library, or even a hotel or business lobby. Trust SoCal Fireplace Mantels to be your premiere provider of ornate fireplace mantels in Los Angeles. SoCal Fireplace Mantels is your first choice as a Los Angeles ornate fireplace mantels provider because we have the widest selection. Choose from several varieties of materials for your fireplace mantel, and from a wide variety of designs. There is sure to be a fireplace mantel that is perfectly suited for your needs. Ornate fireplace mantels are often best set off by natural stone. The variations and coloring patterns in natural stone add an additional layer of complexity and visual interest to your ornate design, giving it an unparalleled depth and richness. Choose from several varieties of marble, such as classic white marble, rich yellow marble, dramatic maroon and white marble, classic green marble, and much more. Alternatively, select sandstone, travertine, or another classic type of natural stone. SoCal Fireplace Mantels also is a leading provider of ornate fireplace mantels in Los Angeles that are made from cast stone. Similar to natural stone fireplace mantels, cast stone mantels offer a range of colors and designs to choose from. Cast stone provides a more uniform color, which is ideal when you want the ornate pattern to be the most noticeable feature of your fireplace mantel. Our designers can also create an ornate fireplace mantel that is custom designed just for you. They will come to your home or business and measure the area as well as view your furnishings and décor to serve as an inspiration for the design. Come visit our extensive 4,000 square foot showroom in Van Nuys to find out why SoCal Fireplace Mantels is your first choice as a Los Angeles ornate fireplace mantels provider. 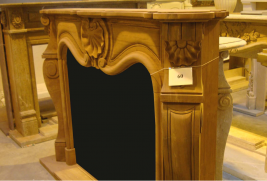 Our knowledgeable sales associates will be happy to show you our extensive selection of ornate fireplace mantels and to help you choose one that is perfect for your needs. We offer services in Los Angeles, Ventura County and Orange County. Ask about our special rates and benefits for you.